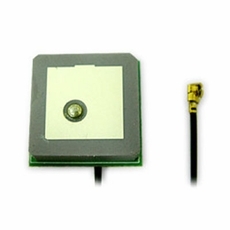 This GPS antenna is a very compact solution with high-gain. At only 19 x 19 mm and 5mm tall!! It is made to be incorporated into tight spaces on your product to enable GPS functionality in a small amount of space. Includes a 100mm cable with a U.FL connector on the end. This antenna has a 30dBi dual-LNA design, offering very high gain for applications where the GPS signal may be weak.